A positive experience was created, with a simple squeeze a puff of powder. A functional shape for Johnson’s Baby Powder, a key brand differentiator with great on-shelf presence. 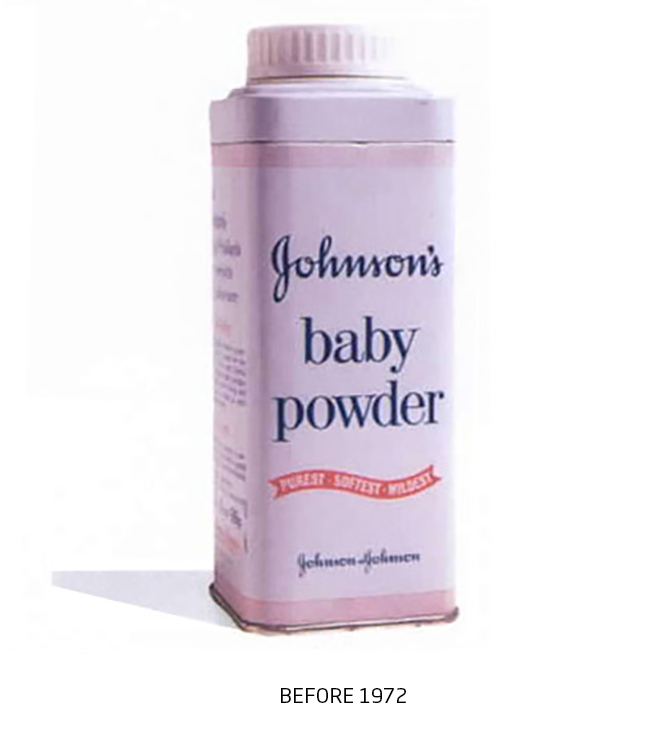 Johnson & Johnson started making medical products in 1886 in the USA, diversifying into baby care eight years later with the introduction of talcum powder. Originally sent to customers to alleviate skin irritation caused by the company’s medicated plasters, the talc was discovered to be an effective treatment for nappy rash – and this early customer feedback led to the launch of Johnson’s Baby Powder. The talc was first packaged in square metal tins, which gradually evolved into taller rectangular canisters. In 1972 Minale Tattersfield designed a new tapered pack for this trusted product, part of parents’ daily baby care routines, using plastic for a more ergonomic container that was light and easy to use. Instead of having to make do with standard proprietary packaging, Johnson & Johnson now had a bespoke design to call their own. With a brief to develop the traditional metal container while retaining key elements of Johnson & Johnson’s well known identity, we used a soft, matt-coated plastic so the pack would be intuitive to grip and the talc expelled by gentle squeezing. As a newcomer to the market, the redesigned pack with its subtle cylindrical shape had great appeal in store and stood out against the competition. Customising plastic mouldings in this way to create a unique shape was a new departure at the time. The design was eventually copyrighted by Johnson & Johnson and became part of the company’s brand equity. To reflect the modern look of the new container, pack graphics and typography were also updated. This melding of ergonomics and aesthetics served Johnson & Johnson well for five years, until the use of plastics became more general and other possibilities available.